One possibility for the boarding stable at 704-706 Greenwich St. is the Baker Transfer Co., who were located here from 1895 to 1899. Proprietors were the brothers, James H. G. Baker (1872?-?) and William Frazer Baker (1864-1930). They were raised in Pennsylvania and established themselves in New York in the late 1880s. James H. G. Baker was listed in city directories as an "agent" at 62 Cortlandt St. in 1889. In 1890 this became James H. G. Baker & Brother at 62 Cortlandt St. and 190 Chambers St. At this time both brothers lived on Greene Ave., Brooklyn. 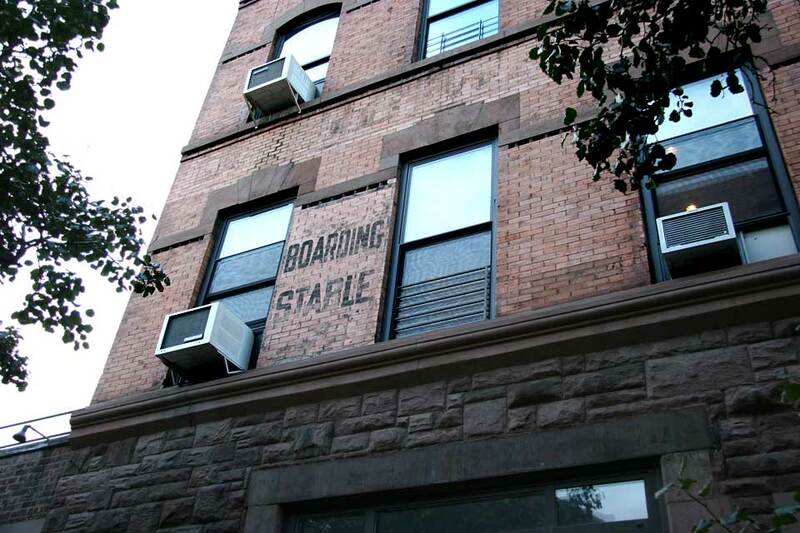 The Baker Transfer Co. was listed at 194 Chambers St. from 1891 through 1894, then moved to 704-706 Greenwich St.
William F. Baker lived at 450 Greene Ave., Brooklyn, at the time of the 1900 U. S. Census. He was 35 years old, born Pennsylvania, Sept. 1864. I have not, however, been able to locate James H. G. Baker in the same census. The brothers were recorded earlier in the 1880 census (James was 8, William 18) living in Taylor Township, Cambria County, Pennsylvania (near Johnstown in Southwestern Pennsylvania). Their father, John, was a coal miner born in Ireland. James H. G. Baker seems to have disappeared after the late 1890s. It may be he died at this time. William F. Baker, however, went on to a career far from moving vans and boarding stables . A brief wikipedia article gives the story as follows: "William Frazer Baker was the owner of the Philadelphia Phillies of the National League from 1913 through 1930. Baker was appointed New York City Police Commissioner in July 1909 by Mayor George B. McClellan, Jr. (New York Times, July 2, 1909). During his brief tenure he was accused of interfering in gambling investigations (New York Times, Sept 19, 1909). He resigned his position in October 1910 (New York Times, Oct. 21, 1910). In January 1913, Baker was part of a group led by his nephew, William Locke (baseball), that purchased the club (New York Times, January 16, 1913). Baker was elected team president in October 1913, following the death of Locke earlier in the year (New York Times, Oct. 21, 1913). … He died of a heart attack on December 4, 1930 while attending a league meeting in Montreal (New York Times, Dec. 5, 1930) …"
William F. Baker was recorded in the 1910 U. S. Census living at 379 Washington Ave., Brooklyn. He was 48 years old and his occupation was "Commissioner, Police." In the 1920 census he was William F. Baker, age 54, "President, Baseball Club," and he lived at 170 W. 73rd St., Manhattan. In 1930 he was 60 years old and lived at 290 West End Ave., Manhattan. He is buried in Green-Wood Cemetery, Brooklyn. His grave stone records his birth year as 1865.